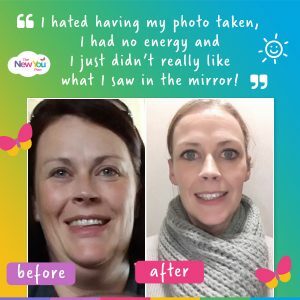 Eilis’ Unbelievable 2018 New You Plan Transformation Revealed! 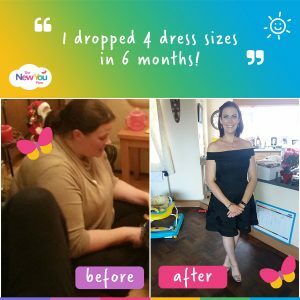 Customer Eilis has been on an unbelievable journey! 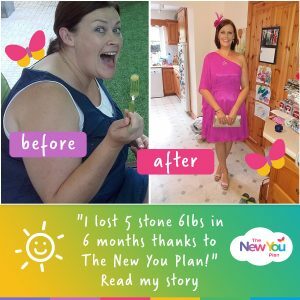 Her New You Plan Transformation saw her losing an incredible 5 stone 6 pounds in 6 months, which is a massive 4 dress sizes. Now maintaining, she shares how her life has completely changed in 2018 in the hope of inspiring others to dare to dream. Describe how you felt before you started the plan? In September 2016 we were on holidays I had finally decided that now was the time to lose weight. I hated having my photo taken, I had no energy and I just didn’t really like what I saw in the mirror. Then two days later I found out I was pregnant with my second son so I put it on hold. However, it was always on my mind and as soon as I stopped breastfeeding I knew I was ready. I just didn’t know how I could lose weight until I found The New You Plan. 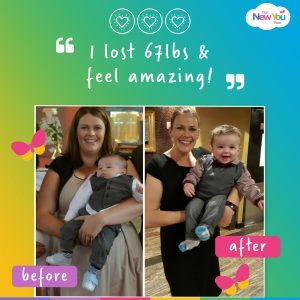 I was in constant pain too with my joints and my pelvis since I had my first son so I was determined to lose weight once and for all. How did you discover The New You Plan? I came across it by chance on Facebook. I had done another ketosis diet before that worked but this one looked so much better than that one! It sounded like the perfect plan for me and I was excited to see where my New You Plan transformation would take me. How has the plan changed your life in 2018? I can run around and play with my 3 year old son with such ease now and have loads of energy. I don’t hide behind the camera anymore. I actually want to be in the photos now. I walk 4 to 5 days a week and can even run with ease! I used to suffer chronic pain in my pelvis after I had my first son and was even seeing a physio for the first few weeks while on the diet. After she saw how much weight I had lost and working with me for a few weeks she told me that she didn’t need to see me anymore as my pain had gone along with the weight! I can shop in any shop now and have a new found passion for fashion which I never had before. Also I am so much more confident since losing the weight and my husband loves the new me. What was your biggest motivator for staying on track? I was 100% determined to get to my goal. My husband supported me all the way but I wanted to get back to the weight I was when we first met almost 12 years before and that was it. What’s your biggest non-scale victory? Fitting into the smallest clothes in my wardrobe that I had kept for 12 years. Since losing weight, what is your happiest memory? Coming back to work after almost 9 months on maternity leave and people walking past me as they didn’t recognise me anymore. What is the nicest compliment you’ve received since losing weight? My 3 year old telling me I look beautiful. 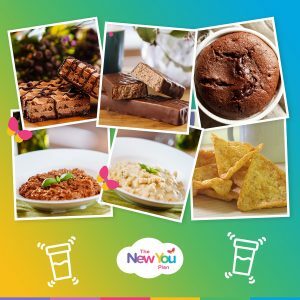 What are your favourite New You meals and snacks? There’s so many to choose from. My absolute favourites are the Chocolate Hazelnut Bars but also love the Brownies, Cheese Tortillas, Chocolate Wafers, Vegetable Chilli and Pasta Carbonara. What advice would you offer anyone thinking of starting the plan in 2019? I would say to anyone thinking of starting the diet to just do it. The weight literally fell off and I have introduced 8 people to New You after they saw how well I had done. The support team are amazing and the Secret Slimmers page on Facebook is invaluable for support, tips, encouragement and jokes. I started at size 20 and am now a size 10. Get started on the BEST TFR Plan TODAY! Getting started is the first step in your journey to a brand New You! To help you understand fully how our plan works, our Get Started page with designed specifically for people new to the plan. Head over to our site where you’ll find tonnes of important information including how our plan works, the science behind it, loads of top tips, information on our meals, as well as real customer testimonials. Click here to visit our Get Started page! *Everyone is different, and we can’t guarantee how much weight you will lose. Check out our success stories to see what our customers have lost. ← Christmas weight loss goals revealed! Thanks for your message, it is lovely to hear from you. We can certainly help you to get into the right mindset to tackle emotional eating. I would love to tell you about how your plan can help change your life 🙂 I am going to break everything down for you. 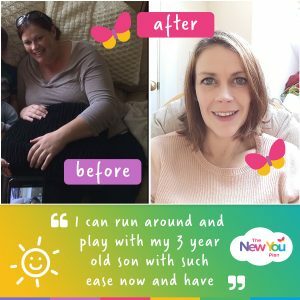 -The New You Plan offers our customers medical grade meal replacement which is covered by the NHS guidelines. Our meal replacements consist of Creamy Shakes, Hot Soups, Delicious Meal, Tasty Bars, Homely Porridge and Scrumptious High Protein Snacks all suitable for ketosis. We have over 40 Meals and Snacks to choose from and are all designed to enable you to switch fuel sources so that your body uses your fat as its primary fuel source, meaning your body is burning your FAT FAST. The beauty of this plan means you WILL NOT feel hunger and you will have lots of energy. 2) How many meals should I have? We recommend you stick to consuming 1 bar a day by limiting this bar you will experience faster weight loss. Like It Spicy? You can add dried herbs and spices to your meals. -Our slimmers average 1 stone a month, this loss may vary as everyone is unique. However, you will start to see results after 1 week. 5) I want to get started Now!